21/11/12 - Acquisition - Pau, Musée des Beaux-Arts - We had been struck by the image presented earlier this year at the Galerie Talabardon & Gautier and had published it in a news item on exhibitions at Parisian galleries. The painting by Adolphe-Martial Potémont, is entitled Les Lettres d’Alsace-Lorraine (ill.) and shows several torn letters, placed on a table next to flowers which include notably a pansy and a forget-me-not. 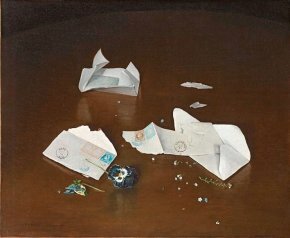 The compositon is especially surprising and although we do not like to use this term, often overstated in art history, expresses a real sense of "modernity" in its tight centring, with the highly waxed table reduced to a brown background, giving off slight reflections thus providing the painter with a chance to display his virtuosity. Painted in 1872, this canvas recounts a particularly tragic event in French history, the loss of Alsace-Lorraine after the Franco-Prussian war of 1870. The letters lying on the table present a specific detail which is perhaps better known to stamp collectors than to historians : the double postage used for letters circulating between the zones occupied by the Germans and those still under French control. The "Alsace-Lorraine" stamps were issued on 6 September 1870 and were used until May 1871. This double postage showing French and Occupation stamps was supposed to be placed by either the sender, then the receiver on arrival, or else the sender alone if he had both stamps available. On 10 May 871, the Treaty of Frankfurt ratified the annexation of Alsace-Lorraine and the double-postage disappeared to be replaced by German stamps. The representation of letters in painting is often a symbol of nostalgia or regret, at times of a loved one who is far away or has died as for example in the work of Claude-Marie Dubufe. Here, the absence, also symbolized by the flowers is that of the two French regions now lost to another country. Adolphe-Martial Potémont was a student of Léon Cogniet. He traveled for ten years between 1847 and 1857 in the southern hemisphere, notably in La Réunion, Ile Maurice and Madagascar, exhibiting regularly at the Salon from 1846 until his death, essentially landscapes and urban views. Potémont also specialized in etchings, either original creations or interpretations of works. The canvas, acquired with the help of the FRAM Aquitaine, will join other works at the Musée des Beaux-Arts in Pau with letters as a subject, notably a painting by Henry Lerolle and another one by Alfred de Richemont, entitled Sacrifice. For Jean-Pierre Mélot, curator of the museum, this work, both in its subject and treatment, provides a link between 17th century still-lifes like those of Joannes Cordua and the contemporary painters of the Ecole de Pau, Jean-Marie Poumeyrol, Jean-Pierre Ugarte and Pierre Soust.